Richmond Gear is the leading manufacturer of professional quality, high-performance ring and pinion sets. The superior quality of these gear sets is the result of years of racing development, outstanding design, and state-of-the-art manufacturing methods. Richmond Street Gears are designed to withstand the rigors of everyday driving, as well as a weekend at the track. Gears available for nearly all popular domestic applications. 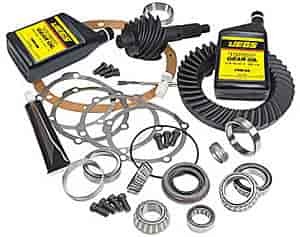 These packages include all components necessary to change rear end gears: Richmond Ring & Pinion Gears, complete installation kit, synthetic gear oil, limited slip additive, Grime Boss Hand Wipes and step-by-step DVD.